Saturday January 29th 1921 A beautiful day. I went after the milk and then up town for the mail and to do errands for Ida. She and Aunty busy cleaning. I called at Mrs Elder before coming back. A year ago tonight left Oklahoma City for Joplin. Ida and I went up-town late in afternoon. Called on Mrs Kimball Got books from The Library. I wrote Lydia and The Cincinnati people. Sunday January 30th 1921 I went up to the hotel to see about a chance for Ida to go to Ft Pierce by Auto after I had gone after the milk. She could go soon after one oclock. I helped her take her things up ready for a start. It was very warm. I read afternoon and evening. Monday January 31st 1921 It was a wonderful day. I went to tell the folks we did not need the milk. was busy all forenoon. Went up for mail after dinner and met Ida. She was pleased with her trip to Ft Pierce. I had a letter from Rob & two papers. I wrote Ott before supper time. We were up town in evening. 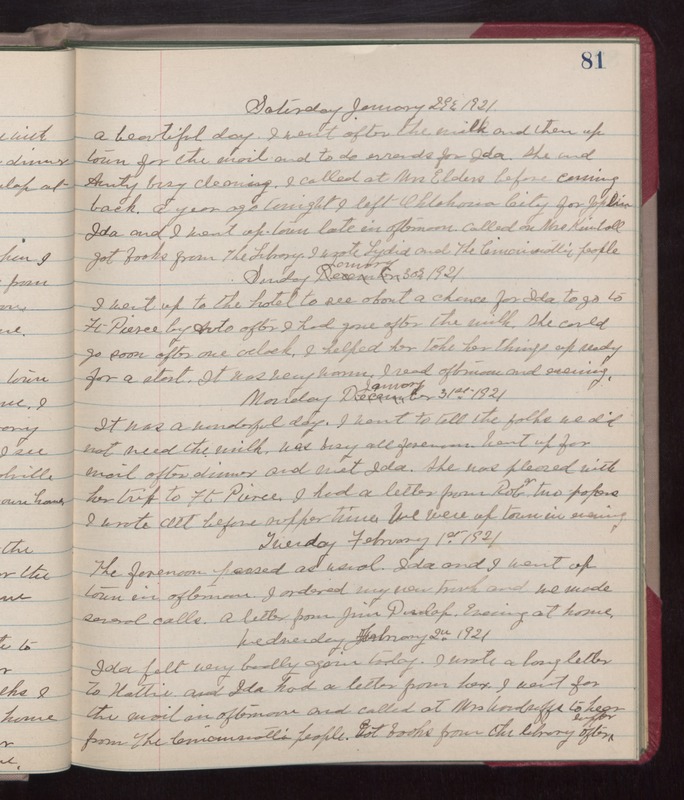 Tuesday February 1st 1921 The forenoon passed as usual. Ida and I went up town in afternoon. I ordered my new trunk and we made several calls. A letter from Jim Dunlap. Evening at home. Wednesday February 2nd 1921 Ida felt very badly again today. I wrote a long letter to Hattie and Ida had a letter from her. I went for the mail in afternoon and called at Mrs Woodruffs to hear from The Cincinnati people. Got books from the library after supper.